today's Basically... post is a basic i use all the time... Nail Tees! they are special Qtips that are super pointy on both ends. they are absolutely amazing for cleaning up little polish slips and booboos while you are applying a mani. there are other brands out there that are similar, but Nail Tees to me always look to be the pointiest... and that's really helpful when you need to get right into a cuticle but don't want to touch anything else! they come in a plastic box... unfortunately, the lid doesn't fit very tightly so it's not the greatest holder. sorry the box is so cloudy, i've had it for a long time! it comes with loads so one box will last you a long time. when it's new, it's difficult to even put the lid back on the box because it's so full! this is what they look like up close... as you can see, the top is much pointier on this one than the bottom. ideally, they both would be super pointy, but quality control isn't perfect, i guess! you can find these at Sally's Beauty Supply! Seated trot without stirrups, good for you! I used to love to ride horses, they are so much fun to hang around. 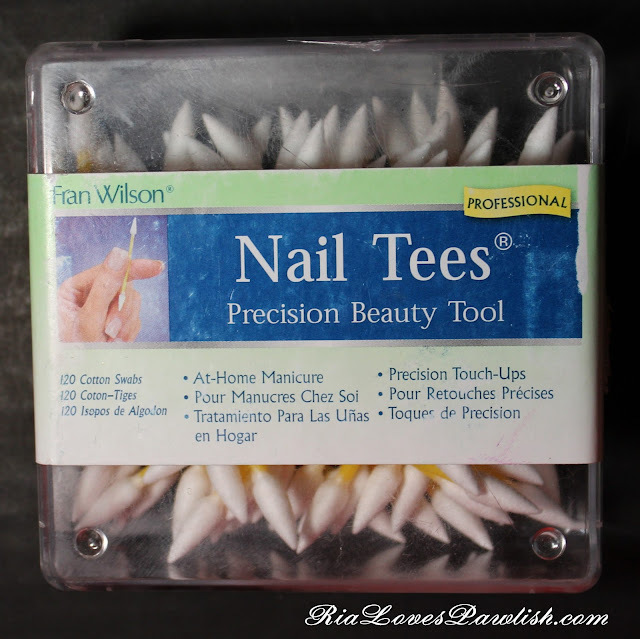 I need some of those pointy nail tees! Thanks for posting!